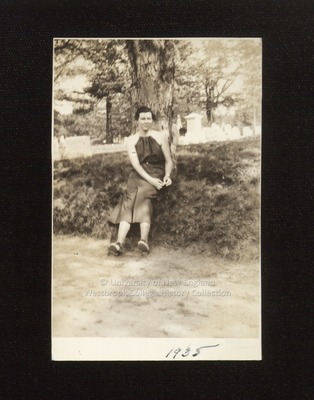 A single Westbrook Junior College student sits on a low banking, leaning against a tree, with Evergreen Cemetery in the background, in this sepia toned candid snapshot labeled 1935 on the front. On the back of the photo in blue ink is written: "Frances Savage. Cemetery was a favorite walk." Frances wears culottes or a split skirt, with a halter top tied at the neck. Her dark hair is short and parted on the side.